I love Decatur, but it’s hard for me to get down to that neck of the woods. I wish it didn’t take 30 minutes to get there, but it does. When I do venture to Decatur, I tend to gravitate toward Iberian Pig. Because of these two things, I haven’t yet tried Farm Burger, which offers gluten-free customers Pure Knead buns, some of my favorite GF buns/rolls I’ve ever tried. And they’re local! Yeah Burger used to have Pure Knead buns but sadly, they’ve switched to another, not nearly as good, bun. Good news for those of us that live north of Decatur! 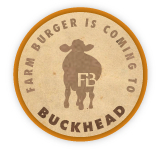 Farm Burger is now opening a location in Buckhead. I’m still not sure when the opening date will be but it’s looking like it should be soon. According to the Jennifer Harris, of the Gluten-Free Examiner, all of their toppings are GF, except the crispy onions, fried eggplant, and barbecue sauce (which contains soy sauce). Last time I checked, Farm Burger’s fries were not yet made in a dedicated fryer but hopefully this will change eventually. Farm Burger takes pride in being dedicated to its mission, its farms, its team and its community. It’s sustainable, local, and looking to “re-route our food system to look more like an ecosystem than a corporation.” This phrase is a mouthful, but I’m liking it. For those of you familiar with Farm Burger, what are your favorite toppings? Anyone tried the pimento cheese? I’ll keep you posted on the actual opening dates in Buckhead! I live right near the new Farm Burger and I am super excited to try it. I just recently went to Urban Pl8 over near Howell Mill (also a little bit of a drive) and it was phenomenal, they always have a gluten free desert (swoon) and offer delicious rice bread whether with your appetizer, burger or brunch. I tried the nut burger and have been dreaming of it since!